Wow I just did that quiz yesterday Joshua. I seen on on fox.com. I did it just out of curiosity, my results was no surprise. Keep up the good work. Here is praying and hoping Obama gets defeated. Thanks for the tip on the iSideWith site. 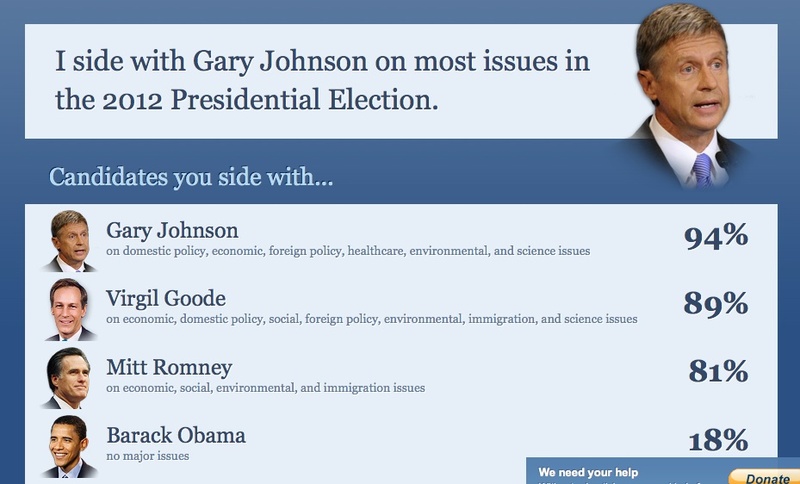 I thought I’d side with the Libertarian candidate (Gary Johnson – 82%) but it turned out that the Rublican candidate (Mitt Romney – 89%) more closer resesmbled my take on the issues… Yes, further research is definitely in order. Since I’m not convinced any of the candidates are what this country needs right now I’m going to have to spend a lot of time figuring out which one should get my vote.